I didn’t camp tonight… and I am good with that. I spent the last 3 hours out in my barn and walking along a dark road, though. I walked with God. I really think I did. First there was the fire. I didn’t have the right stuff to get it started, and my firewood was wet. So I decided to get out one of my books inside the barn and read. As I thought about which one, as I had brought two, I kept coming back to this word: STOP. One of my books is about maximizing energy, getting focus, that kind of stuff… there are some things I am working on in it and need some time, but I just sensed that I needed to stop tonight – read the other book: Waking the Dead. This is a much easier read – not so much inspirational and inspiring, but maybe eye opening? Tonight, I wake up. I open my eyes to my true identity, and accept my destiny. As I wrote that I wasn’t really sure what it meant, but I needed to write it down. Maybe for later? I was having a hard time focusing. As I continued on, I got more and more drawn into the reading, into this whole concept of walking with God, truly knowing him (not just about him), and living life day by day like that. OK, who am I? What is my true identity? What is my new name? That question has been on my mind for a while. A lot of things I’ve read talk about a new name, who we are in Christ, the unique thing he will use us for as we step into his will. I wasn’t tired, but after about 30 – 40 pages I sensed it was time to stop. And go for a walk. Don’t know why, really, that was just the next thing to do. So I did it, set out west on the state road in front of my house. Is that me? Is that my name? Strange stuff. I don’t normally think this way. But so much stuff came together. 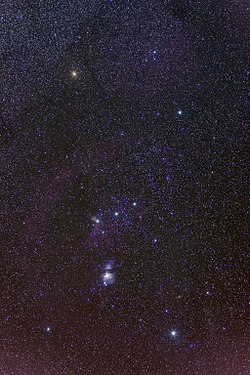 I have been catching glimpses of Orion lately – I like looking for the seven sisters at night – and they’re off to the north of him, so I see this other constellation a lot, too. But now thoughts are bubbling in my heart, and it’s asking, Is this it? Am I battling the bull? I don’t know. And I don’t care if I don’t know. But I’m not just going to call all this mindplay, either. I can’t. It’s a question I’ve been asking myself for a year now, and tonight, a night originally planned to be sitting in the woods, in a tent, or around a campfire, where the stars wouldn’t be so visible, was changed to a night where I was walking down a dark, dark road, right into my new identity. Not just the constellation, but that idea of accepting who I am, a child of God, a demonstration of His glory, the masterpiece of His creation. That is each of us. …more to come, I am sure!